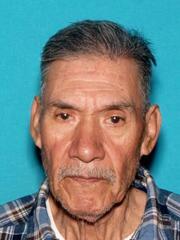 IGNACIO HERRERA, 76 years old, suffers from dementia. Last seen at approximately 1400 hours on 01-19-2019 walking in his condo complex at 3877 Pell Place in San Diego. Left wearing a blue, white and red plaid flannel shirt and blue pants. He has no known physical disabilities and speaks limited English. He had no regular destinations but walked with his family in the Del Mar Highlands Town Center area.